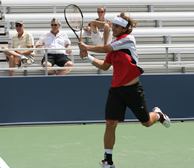 Six American men competed for seven spots into the main draw of the Western & Southern Open on Saturday, the first day of play for the 2012 tournament. Jesse Levine became the first American to advance into the second round by securing an upset over the No. 4 seed Lukas Lacko of Slovakia 3-6, 6-3, 6-3. Levine, who is ranked only two spots removed from his career-high of World No. 85, qualified for and advanced to the round of 64 at both Roland Garros and Wimbledon earlier this year. In the next round, Levine faces Olivier Rochus of Belgium, who defeated the 2011 Mixed Doubles US Open champion Jack Sock of the United States by a score of 6-4, 7-5. Joining Levine into round two is wild card Rajeev Ram, who scored the biggest upset of the men’s tournament so far by defeating the No. 3 seed Grigor Dimitrov 7-6(5), 7-6(3). Ram is currently tied for 14th place in the 2012 Emirates Airline US Open Series Bonus Challenge Standings following semifinal showings at Newport and Los Angeles. While Levine and Ram won their respective first round challenges, two Americans failed to be as successful in their opening matches of the qualifying event. The youngest American in the men’s draw, 18-year old Christian Harrison, fell in straight sets to the No. 2 seed and 2011 San Jose runner-up Alejandro Falla of Columbia. Harrison, whose brother Ryan is a main draw competitor, was bidding to win his first match at the Lindner Family Tennis Center. In round two, Falla, who achieved his career-high ranking of No. 48 in July, will face the No. 10 seed Yen-Hsun Lu of Chinese Taipei. Also out for the Americans is Russell, 34, the oldest United States competitor in the men’s draw and a recent quarterfinalist at both Los Angeles and Atlanta. Other results over the course of day one qualifying action include the No. 6 seed Marinko Matosevic’s three set victory over Benjamin Becker of Germany, the No. 7 seed Leonardo Mayer’s win versus Igor Andreev 6-3, 6-1, and Sergiy Stakhovsky’s upset of the No. 11 seed Igor Sijsling 6-3, 6-4.